Dressing for your salad? Dip for your carrots? Yogurt for your strawberries? Used to be pretty messy to tote these toppings until BNTO came along. Based on the compartmentalized Japanese Bento Box, the folks at Cuppow worked up a cool idea for the humble Mason Jar. A BPA-free adaptor (made from recycled materials), sets right into the top of a wide mouth Mason Jar- really a jar within a jar- and is the neat and tidy answer to adding liquids to your lunch. Separate the wet from the dry with BNTO; the go-to adaptor for people on the go. Dressing for your salad? Dip for your carrots? Yogurt for your strawberries? Used to be pretty messy to tote these toppings until BNTO came along. 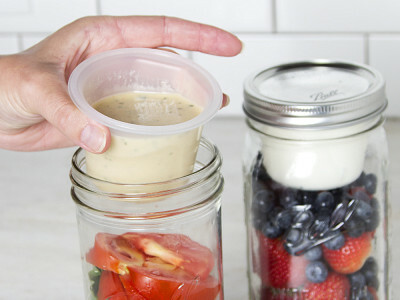 Based on the compartmentalized Japanese Bento Box, the folks at Cuppow worked up a cool idea for the humble Mason Jar. 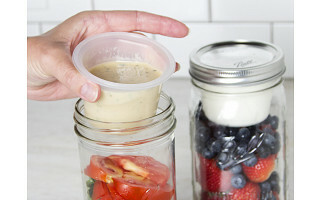 A BPA-free adaptor (made from recycled materials), sets right into the top of a wide mouth Mason Jar- really a jar within a jar- and is the neat and tidy answer to adding liquids to your lunch.